In the 1950s and 1960s, Yan Man-leung was a prominent industrialist in HK who earned the nickname of “Poetic Industrialist” for his love of composing Chinese poetry and his role as the founder of two leading industrial enterprises in HK – Camelpaint and United Weaving Factory. A native of Toishan in Guangdong province, Yan Man-leung came to HK at the age of 16 and started working as an intern at the HK branch of Banque Industriellede Chine (中法實業銀行), a joint venture bank between the Peking government and French interests founded in 1913 which had branches all over China and offices in Paris. He studied business part time through the correspondence school operated by the Shanghai Commercial Press and read a lot of Chinese literature on his own in his spare time, laying the foundation for his poetic pursuits. He worked at Banque Industriele and its successors for a total of 15 years, rising to the position of deputy Chinese manager before joining seven fellow Toishan natives led by his fellow clansman Yan Bing-kwan (aka Alfonso J. Ben) and Harry J. Lowe (see articles) in founding National Lacquer & Paint Products Co Ltd, the manufacturer of “Camelpaint” in 1932. 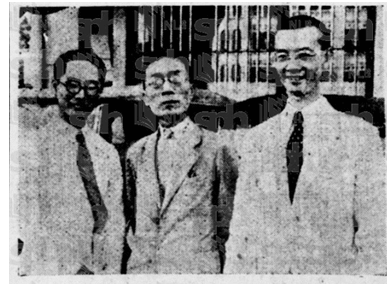 At Camelpaint, Yan Man-leung served as vice president and treasurer for a decade and from newspapers records traveled 5-6 times to Southeast Asia in the 1930s to help promote the firm’s products in markets such as Singapore. After the end of World War II, he founded Hong Kong Can Company, located at 147-149 King’s Road in North Point which manufactured tin cans for paint, presumably a supplier to Camelpaint. Left: United Weaving’s booth at the HK Products Expo during the 1970s (HK Memory); Right: United Weaving’s booth at the HK Products Expo in 1967 which came in second in that year’s Stand Contest. In 1950, Yan formed United Weaving Factory at 143-145 King’s Road next to HK Can. Initially the firm made fabrics but by the mid-1950s, Unitedbegan making its “Clipper” brand of shirts (順風恤) and “Great Wall” brand of bed sheets and table covers which were exported to the UK, the US and Southeast Asia. The 10,000 sq ft, 5 story factory on King’s Road had 200 workers at the time. A sociable character who referred to jokingly himself as “Toishan Uncle”, Yan was extremely active with the Chinese Manufacturers Association in the 1950s and 60s, often placed in charge of publicity for the Annual Product Expo. 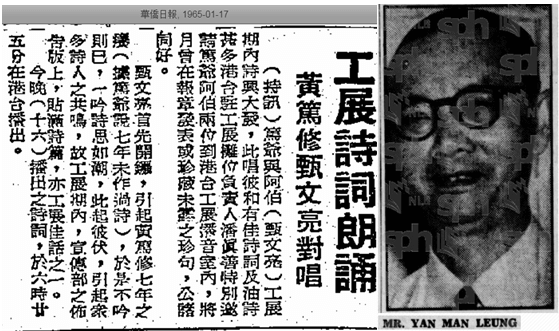 In 1955 and1959, Yan led the CMA delegation to Singapore (one of his many trips there) and supervised the HK Products Fair in Singapore those two years, with the latter one attended by over 200,000 visitors. In August 1961, Yan led the CMA delegation to Australia and later that year, he went on Redifussion TV with CMA chairman ChuShek-lun to promote the HK Products Expo. Although he was an industrialist with limited education, Yan was very interested in cultural affairs. Hewas constantly writing Chinese poetry and even published a 60 pages compilation of his poetry entitled “Ten Years Review of My Life” (十年甘苦集, English title according to Yan’s bio in the 1967 HK Album, could also be translated as “A Decade of Bitter and Sweet”) in 1958. He was also chairman and director of China Cultural Enterprise, Ltd, which was incorporated in 1949 and dissolved in 1986. 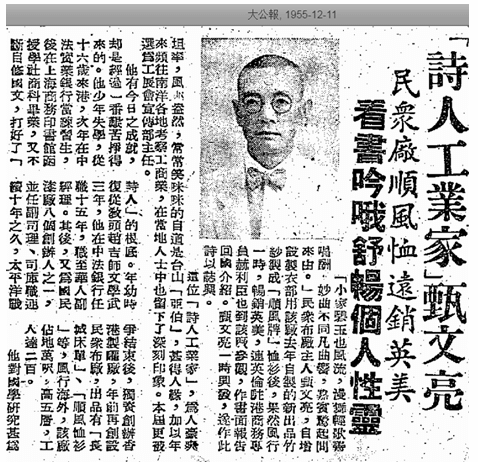 The firm was managed by Tong Big-chuen MBE, who was Chief Editor for Sing Tao Daily and published books and periodicals such as Home Life Journal. In 1966, Yan started a 24-room school by the name ofAsia English Academy(亞洲英文書院)at his King’s Road property which offered classes from kindergarten through Form 4. He personally donated 10 full scholarships and 50 half scholarships and installed Fu Yiu-wah(傅耀華) as headmaster. Unfortunately, the school did not appear to have survived. Yan and his first wife Yee Sau-ho (1901-1964) had two sons and four daughters. Their eldest son Edward Stephen Yanne (甄德華,1922-1998) was enrolled at HKU but when the Japanese occupied HK, he moved to Chungking where he worked for the US Army first as a civilian interpreter and later as a GI. He finished his undergraduate studies after the War at the University of Michigan where he received his degree in 1950. He returned to HK where he first worked as a reporter for South China Morning Post and HK Standard before entering the legal field in 1955 by joining the firm of D’Almada Remedios and headed to the UK in 1959 for legal studies. In 1962 he was admitted to practice law in HK and eventually became a magistrate by the 1970s before retiring to Canada. His wife Rosina was the widow of Tiger Balm heir Aw Hoe and his stepchildren included Allan Aw (last managing partner of Arthur Andersen in HK) and Marcia Aw (executive director of Changing Life Foundation). As Edward was not interested in the family business, Yan Man-leung groomed his second son Andrew Yanne (甄家珍, 1934-) to take over. Andrew studied textile for 4 years at the University of Leeds in the UK during which he had won many textile design competitions and he had interned at three leading dyestuff producers in Europe – Brunner Mond in the UK, Bayer in Germany and Ciba in Switzerland before returning to HK to join the family business in 1963. In 1963, the Yan family decided that the neighborhood where its factory was located was turning more and more residential and relocated the factory to Chung Hing Industrial Building on Tai Yau Street in San Po Kong in Kowloon. The factory site on King’s Road was re-developed by the family into United Building (民眾大廈), a residential complex which was finally completed in 1967. 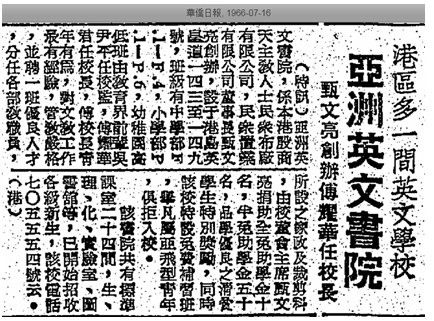 Given the economic downturn at the time due to banking crisis and riots, sales were slow and old newspaper clippings show aggressive discount and lucky draw campaigns to sell the units.Taiwan Man Sang Products (台灣民生物產), the pro-Taipei department storeoperated by General Ho Shai-lai, opened its North Point branch at the United Building in 1968. Under Andrew, United shifted from the highly competitive field of making shirts and sheets to the specialized field of making glass fiber membranes, which are used to waterproof roofs of buildings. Success of the business was evidenced by the signing of Shell Oil (maker of the complementary Flintkote bitumen emulsion) as master distributor of United’s glass fiber membrane in the Philippines in 1976. In March 1983, Yan Man-leung died at the age of 82. As a firm, United Weaving Factory was incorporated in 1962 and dissolved in 2013.In 2009, Andrew Yanne and his nephew Seattle native Gillis Heller (head of legal at Pico Far East)co-authored “Signs of a Colonial Era”, a book which explore the origins of street names in HK. This article was first posted on 29th October 2018.